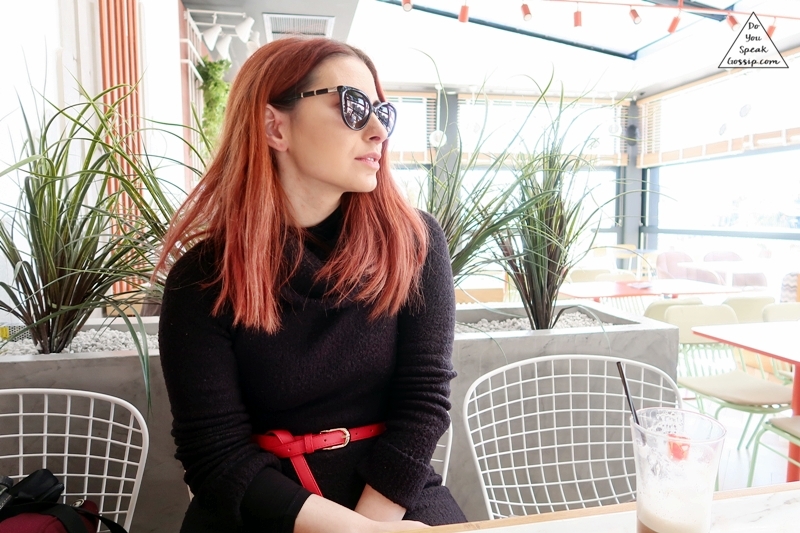 Ελληνίδα fashion blogger Archives - Do You Speak Gossip?Do You Speak Gossip? This is probably the last wintery outfit post. As we’re moving towards spring, and lighter clothes, I’ll start transitioning to more weather-appropriate outfits. I wore this one, one month ago, on Valentine’s Day, when we went brunching with my boyfriend. The weather was amazing, so I didn’t even need to wear that many layers, but I’m always careful when it comes to early spring. This is one of the warmest dresses I have in my wardrobe, and I actually have it in two colors, and I love them both. I combined the dress with my pair of over-the-knee boots, and I added the red belt for a pop of color, to match the “mood of the day” (Valentine’s Day and all). Not pictured is my burgundy coat, which I wear all the time lately. We took these photos as we were waiting for our brunch to be served, at the restaurant. I had an omelette, and an iced coffee, for the first time this year. Hope you like it! See you soon with new outfit posts. You probably can’t really tell, but I’m actually wearing two dresses, one on top of the other in these photos. The white one on top, is kiiinda short, and I needed those extra centimeters of fabric, plus the black one I’m wearing under the white one, has a beautiful necklace attached to it, which made my white dress look way more interesting. I matched the dress with the a very similar blazer I have in my collection with leather-like sleeves, and I really liked the result. It’s been snowing all day today, and I really love watching the snow fall, but I do love sunny days like that one, more than anything. It’s difficult to photograph white clothes in such a bright light, but it was worth it. And in the end, I did like the result. Do you like this look? You know how much I love burgundy in winter, and you might have also noticed that I’m slowly trying to expand my outerwear collection for the past few years. So a few weeks ago, I started searching for a new coat, and I found this beautiful burgundy one at Spartoo.gr. It’s from Benetton, and I bought it at 20% off. I got mine at size FR38 (IT42). I was going to size up, to be able to wear thick sweaters under it, but the site said to size down, so I got the 38. I love its color and fit, but it is way thinner than I had anticipated. It is really beautiful though, and I think it looks good on me, so I’d definitely be keeping it. 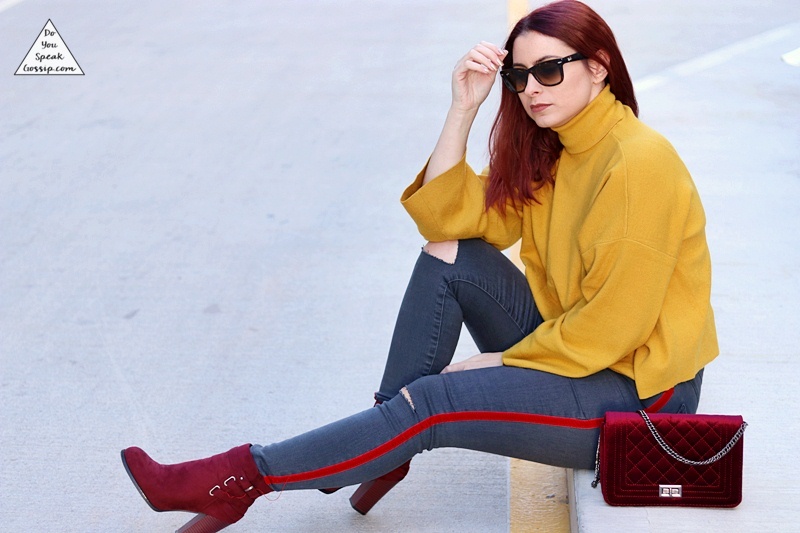 Even though it’s more on the violet side of burgundy, I paired it with my burgundy bag and sweater, and my favorite over-the-knee velvet boots. I loved the look, and I’m glad we were able to photograph it that day, because a lot has happened in my life since then, and that’s why I had to take a week off blogging. I’m back now though, and I’d be posting regularly from now on. Hope you like this look! Hiii! Long time no see! I had to take a break from posting unfortunately, because I was really swamped with Vlogmas, and the move back from Athens. This is the first look we shot back in Athens (because I’m now back in Thessaloniki, since Saturday), and I really liked how it turned out. I love combining my new mustard sweater with red or burgundy. It looks a bit like ketchup and mustard, and these two look great together, don’t you think? haha We shot these pics at Stavros Niarchos Foundation when we went one day, and I really love the contrast with the all grey background. I wore my new Zara jeans for the first time, and combined them with my burgundy ankle boots, and my velvet bag, which goes wherever I go this winter. I also changed my hair, in case you didn’t notice. It is a bit faded in the photos, and looks more red than violet, but it is the color I had at the ends of my hair for the last couple of months. Hopefully it will look more violet than red next time. Do you like my look?